A native of Louisville, Kentucky, Dr. Katie Babaliaros is a Phi Beta Kappa graduate of Emory College where she received a B.S. in neuroscience and behavioral biology. She simultaneously earned a medical degree from the Emory University School of Medicine and a master’s degree in public health from the Rollins School of Public Health before completing a residency in obstetrics and gynecology at Emory. During her residency, she was named Outstanding Resident in Maternal Fetal Medicine, Gynecologic Oncology and Continuity Clinic. She is a member of the American College of Obstetrics and Gynecology and the Georgia Obstetrical Gynecologic Society. She began her career in private practice in 2014 and joined Peachtree Women’s Specialists in March of 2015. Dr. Babaliaros has a special interest in adolescent gynecology, contraceptive management, minimally invasive gynecologic surgery and high-risk pregnancy. She is certified to place Mirena and Paragard IUDs and the contraceptive insert Nexplanon. Dr. Babaliaros lives in Atlanta with her husband, infant son, and fur-child. She enjoys teaching her son to swim, listening to 70’s rock and roll and bicycling. 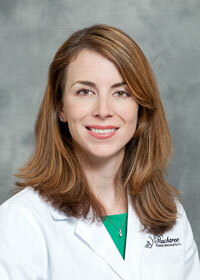 She sees patients in the Buckhead and Vinings locations.